All Conference North matches will be segregated this season. Depending on the expected away support, away supporters will be allocated to either the northern corner of the York Street stand or the Town End terrace (coloured yellow in the diagram above). Entrance to these areas is via specific turnstiles. All the stands are segregated from each other, so you must make sure you go through the appropriate turnstile to get to the stand you want to go to. Boston United supporters should use Turnstiles 1 & 2 for access to the Staffsmart stand, Turnstiles 3 & 4 for access to the York Street stand and Turnstiles 5 & 6 for access to the Spayne Road terrace. 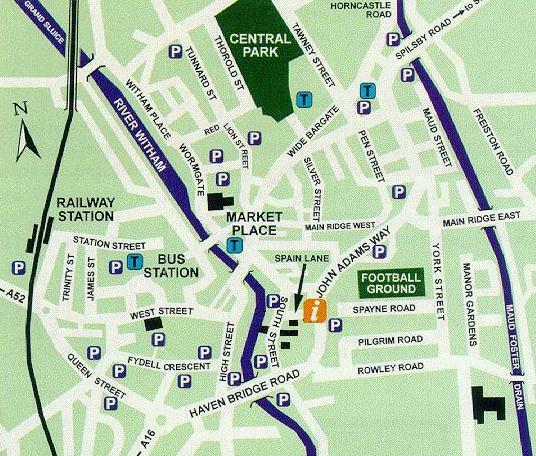 Away team supporters should use their designated turnstiles (7, 8, 9 and 10) in Spayne Road or (3 and 4) in York Street to get into the appropriate away team supporters' enclosure. Matchday programmes are only sold outside the ground from the Programme Huts. This season they cost £3.00. Click here for route maps, a town street map and an aerial photo. A1 to A17 Sleaford to Boston, over rail crossing, bear right at Eagle pub to lights over Haven Bridge, straight-on along John Adams Way (dual carriageway), turn right at traffic lights into Main Ridge, then right again into York Street. There is no free parking available at the ground, the only parking available at the ground is for permit holders only. Away supporters travelling by car are advised to use the NCP car park off John Adams Way (after crossing the river take the first exit left off John Adams Way into the car park). If you plan your trip with a journey planner the postcode of the ground is PE21 6JN. Route to ground on foot (see street map) - Head down Station Street towards the Stump (the large church tower which dominates the skyline for miles around). At the end is a Police Station. Go through the car park and nip round the right side of the Police Station, then head over the footbridge over the river. On reaching the other side, turn right up an alleyway (Church Lane) towards the Market Place. Keep going straight on, past the Britannia Inn (a Batemans pub), across a pelican crossing and keep going. Veer right down South Street and cross the road. Look out for a small road to the left called Spain Lane. Head down Spain Lane past the Blackfriars Arts Centre until you come to John Adams Way dual carriageway. There is a staggered pelican crossing to get you across. The ground is in front of you down Spayne Road. All away team supporters should enter the ground by their designated turnstiles in the Spayne Road to get into the Town End terrace. Altogether it is about a ten minute walk if you don't get lost! Use the National Rail Journey Planner to plan your visit. Use the Transport Direct Journey Planner to plan your visit.